In my last post I promised - or at least implied - that I'd be writing soon about my latest graphics tablet digital artwork trials. Well, I must confess to yielding to the temptation of drawing with fountain pens and paper. 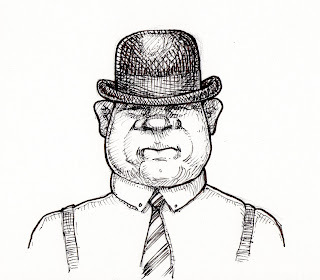 I have been listening to the audio book version of "The Invisible Wall" by Harry Bernstein, and his description of men wearing bowlers inspired me to draw this sketch. And, rather than turn on the computer, I just uncapped a few fountain pens and sat back in my comfy wing-backed chair and sketched the guy you see here above. He's mostly drawn after Bernstein's descriptions of his father. I used a Pelikan M215 fine point and Namiki Falcon soft fine point for this sketch, with Noodler's Feather-X black ink. I really like the graphics tablet but it is not a sufficient substitute for a pen nib on quality paper.